Even people not in the know, when it comes to the stock market, have heard how the price of gold continues to soar. The price of gold per ounce hit a record $1,830 on Thursday, marking a steady climb in the months-long rapid escalation of the price of the metal. Jewelers across the country are reporting a noticeable increase in the amount of people coming in to sell their gold jewelry, which some are reluctant to refine. The economy’s hiccup earlier in August contributed to the increased number of consumers selling gold, Rotenberg said, and also to the types of gold jewelry they’re bringing in. Now he’s seeing scrap metal again, which leads him to believe that consumers are finding gold to sell that they haven’t considered before, including mementos. 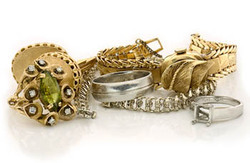 So if you’ve been waiting to clean out that old jewelry box of yours, get to it sooner rather than later. The time is most definitely golden. Check out our page on how its done by a reputable jeweler such as ourselves.